(Please Note: This entry will eventually get to Cherry Almond Granola… the title of the entry is not a misnomer). This weekend the results of several recipe tests were somewhat unsuccessful (largely due to my own mistakes – there was nothing inherently flawed in the recipes I was trying). Friday night Kirk and I got off to a good start with another batch of my basic Chili (this is the second time I’ve made this particular Chili recipe, and it’s one I’ll be sure to write about sometime soon). While the Chili was cooking, I was standing along in our apartment, staring into the fridge at a 4lb chicken I had bought at the store that afternoon. I don’t know why I bought it – – – all I can say is that it called to me in some strange way that only cooks (or people trying to learn how to cook) can understand. It said, “I could be your crowning glory, your chance to impress everyone (“everyone” being Kirk) with your insanely awesome roasting skills. Buy me. You won’t regret it.” So I bought it, without really knowing HOW to roast a chicken (having never attempted something like this before). I assumed there would be nothing to it – rub some stuff on the chicken – herbs, spices, salt, pepper, toss it in the oven for some specified amount of time, check it’s temperature, and voila! Kirk and I would have a delicious roasted chicken to munch on for the rest of the weekend. No such luck. So there I was, staring down a raw 4lb chicken in my fridge as the chili was simmering on the stove. I shut the fridge door before doing anything drastic. I needed to do some research. I pulled out my computer and started browsing and rather quickly discovered a recipe on one of my favorite food blogs (Simply Recipes) for a roasted garlic chicken. Now really… you can’t go wrong with anything flavored with garlic! (or can you?!?!?!). I mixed together the brining mixture and tossed the chicken in a giant zip lock baggie followed by the mix. I turned the chicken around a few times (to make sure it was sufficiently coated), and laid it in a large bowl and put it back into the fridge. I felt very pleased with myself. I had never brined anything, so I felt like I had accomplished something new and exciting. The next evening Kirk and I came home from doing some thrift-store hunting (where I found a spectacular set of wooden salad bowls!) and I proceeded to lower my center over rack slightly (to ensure that the chicken would actually be centered in the over, given it’s size) and preheated the oven. I drained the brine and prepped the chick on the roasting rack and dusted it with some salt and pepper. I tossed it in the oven with the meat thermometer and left it for about an hour and 15 minutes. When I checked on it, it had browned beautifully and the thermometer was reading the correct temperature. I pulled it out and stabbed it with a fork – the juices ran clear. We proceeded to let it sit for about 10 minutes before carving it. As I started to carve the breasts, they looked succulent and delicious. However, as we moved down the bird (to the thighs), the meat looked undercooked and the juices were no longer running clear. Oh no. We stopped carving and decided just to eat the breasts, which were clearly fully cooked (in fact, the top parts of the breasts were slightly overcooked and a little dry). The chicken was ok… but not as spectacular as I had hoped. We ended up bagging up the rest of the chicken and throwing it away. So now I’m left wondering what I did wrong: Should I have cooked it breast-side down? Should I have left the oven rack in the very center of the oven? Should I have turned the chicken midway through roasting? Should I have cooked it at a lower temperature for a longer period of time (I cooked it at 375F for over an hour) Is there something terribly wrong with the heat distribution in my oven? Should I have taken the temperature in the thigh instead of the breast? (I know that’s what I should have done… I misread the instructions and that’s my mistake on being uninformed.) What went wrong? Why did my beautiful chicken end in such disaster? If I had left it in longer in order to make sure the thighs got fully-cooked, the breasts would have been WAY overdone. Kirk and I spent some time chatting about the roasted chicken disaster, and he suggested that maybe I’m just not good with full-bodied poultry. My Thanksgiving turkey last year was overcooked and dry. I tend to be ok when I’m just working with part of an animal (for example, baking or sauteing chicken breasts tends to work out ok), and I seem to be pretty good with other kinds of meats (pork roasts tend to be good, except for the one time when my meat thermometer was not functioning properly). Basically, we came to the conclusion that maybe I’m just better at baking than I am at preparing “savory” meals. Things tend to turn out pretty good when I bake, but when I try to put together real meals they tend to be touch-and-go (sometimes they’re fabulous and sometimes not so much…). So, that whole long story wasn’t for nothing. I had to ERASE this terrible experience from my kitchen’s memory, so I knew I needed to redeem myself the next day. In order to put the kitchen cosmos back in order, I decided to try a new version of something I’m fairly comfortable with: homemade granola. I have to admit, this is one of the better recipes I’ve come up with. Most granola recipes are similar – they usually have oats, nuts or coconut, something sweet or spicy (sugar, honey, cinnamon, nutmeg…), and some kind of dried fruit. Once you get comfortable with different flavor combinations, granola is one of the easiest things to experiment with, and it always makes your place smell divine. I’ve recently been seeing more recipes with dried milk powder in them, so I thought I might experiment with that this time around as well, and the results have thus far been excellent. This recipe has been somewhat inspired by my love of Whole Food’s Cherry-Vanilla Granola, but admittedly it doesn’t really taste like Whole Food’s granola. It’s something new and special all on it’s own 😉 So far I’ve had it with milk (eaten like any other traditional cereal) and mixed into yogurt. I would endorse both of those modes of consumption. In a small saucepan, combine the brown sugar, milk powder, honey, apple juice concentrate, vegetable oil, and almond extract. Cook over medium heat until all sugar is dissolved. Remove from heat. Mix together oats, almonds, and coconut. Pour warm sugar mixture over oats and stir it until all of the oat mixture is evenly coated. Spread the mixture into a 9×13 or larger pan that has been sprayed with non-stick cooking spray. 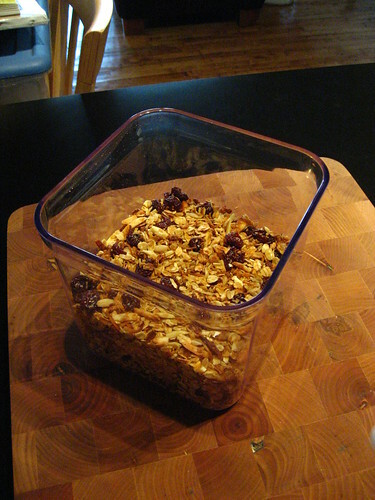 Once it has cooled, mix in the dried Cherries and store in an airtight container. 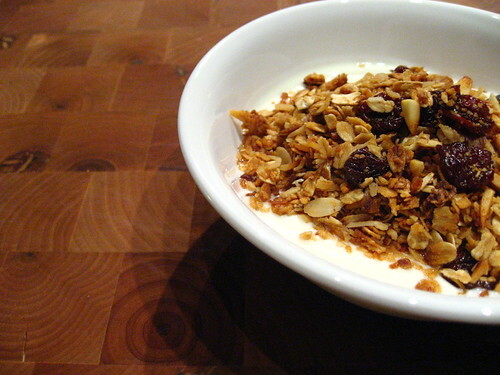 This recipe is a great basic granola. You could try it with different dried fruits (chopped dates or cranberries come to mind), and you could try vanilla extract instead of almond extract. You could also try adding a sprinkling of cinnamon if you want a slightly warmer, more seasonal flavor (perfect for fall and winter). Also, if you’re making it for a large group, this recipe easily doubles 🙂 Next time I make it I might cut some of the sugar, but the sugar can easily be adjusted depending on your own personal tastes.